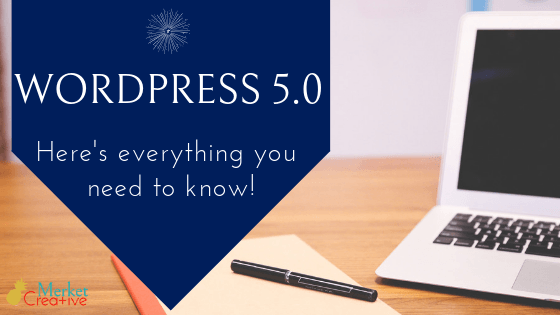 WordPress 5.0 is scheduled for release today! This release is a big one, and WordPress professionals like me have been anticipating this update for months now. Blogging just became more beautiful. The Gutenberg editor brings powerful editing without forcing you to write any line of code. If you blog at all, I definitely encourage you to familiarize yourself with Gutenberg as it will change your blogging game in the best way. Gutenberg includes building blocks, similar to Divi, Beaver Builder, or Elementor, though they are now part of the WordPress core. This makes for lightweight blogging, since you won’t need an additional plugin. If you don’t blog, it’s probably not necessary for you to spend precious time familiarizing yourself with Gutenberg right now. Just put a little bug in the back of your brain that it’s out, it’s proud, and it’s here to stay. The classic editor (lovingly known as the WYSIWYG editor) is still available for you to use. If change makes you want to run and hide, you’ve got some transition time. If you care about security (and you should), be sure to update your site to WordPress 5.0. WordPress core updates are absolutely crucial when it comes to the security of your site. If you’re not on a maintenance plan where I handle these updates for you, be sure you update your site soon. Check for conflicts when updating to WordPress 5.0. Any time you run updates, it’s important to check for functionality. Most plugins and themes are updating to ensure compatibility with WordPress 5.0, but I’ve learned to double check updates anyway. Gutenberg is an important core update that will likely experience major hiccups. If your site theme isn’t prepared for Gutenberg, that’s to be expected. Run the update as soon as you can. If you need help maintaining your site (because you have more important things to do than worry about the compatibility of WordPress 5.0) don’t hesitate to reach out. If you’re on a maintenance plan, this update is handled for you. Carry on with your day. If you’re NOT on a maintenance plan and would like me to help you with this major update, shoot me an email! Let’s get you on my schedule ASAP. Never fear – WordPress updates are ALWAYS a good thing. There’s usually a few bumps along the way, but those bumps are on a fabulous road to bigger and better things!